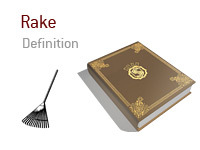 What does the term "rake" mean in poker? What is the definition of the term "rake"? Rake is the commission fee taken by a poker room for operating the game. The commission is scaled to the buy-in and generally equals 5-10% of the pot in each hand. Most often there is a set maximum amount for the rake per hand. The set maximum amount comes into play when the stakes are high. Rake is sometimes charged as a one time fee as part of the entrance buy-in to the tournament. When you see a tournament with a buy-in of $150 + $12, the $12 amount is the rake charged by the poker room for organizing the event. The origin of the term "rake" probably comes from the tool that is used by the croupier at the casino to move chips around on the table.